Not too long ago, a friend sent me a link with the most searched foods in every state. As I read the list, I realized I'd shared recipes for 10 of these foods. While I ring in 2018 by preparing new blog posts, I thought I'd share these oldies but goodies from previous years. Did your state make my list? Alabama: My grandmother's made from scratch pound cake has been one of my top 10 posts since I shared the recipe in 2013. Arizona: You don't need a lot of chilies to add heat to this crock-pot chili. Illinois: This chicken and wild rice soup is similar to one served at a popular restaurant chain. Indiana: Hoosiers hankering for noodle casseroles might want to try this oodles of noodles lasagna recipe. Kentucky: This peanut butter fudge requires no cooking, unless you consider softening ingredients in the microwave as cooking! Maine: You don't have to roll, cut out or fry these doughnuts. Michigan: I don't make dessert very often, but when I do chances are I'm making these no bake cookies. Ohio: The Buckeye State loves the combination of chocolate and peanut butter, especially in the form of peanut butter brownies. Vermont: One of the few states whose most searched food is a vegetable. 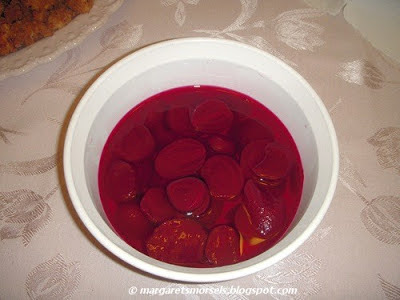 These pickled beets taste just like what my mom used to make. West Virginia: West Virginians love pumpkin desserts. I hope they would agree pumpkin pie goes from ho hum to wow with this tasty pecan streusel topping. If your state isn't listed, you can view the complete list here. You're making my mouth water, Margaret. I'll have to try some of these recipes. Wish I were as good a cook as you! Aw, thank you, Tracy. Happy New Year to you and your family.